This Easter has been the warmest and sunniest for a very long time. 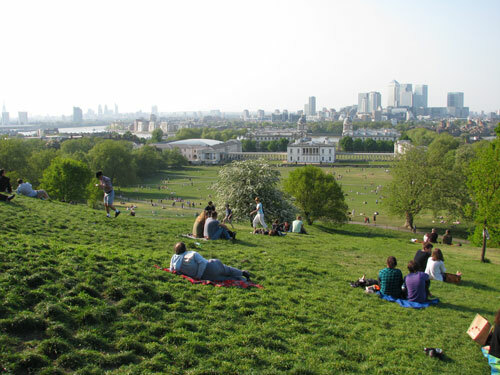 So on Easter Monday we took ourselves off to Greenwich Park and sat on the hill, basked in the sunshine and looked at London. We have a rule which states we never ever get in a car and drive out of London on a bank holiday - especially if it's sunny. The queues of traffic trying to get back into London in the evening can be horrendous. So we did the next best thing. We drove down to the bottom of the Isle of Dogs, admired the Canaletto view of the Old Royal Naval College from Island Gardens and then caught the Docklands Light Railway through to the other side of the River and emerged next to the huge renovation scheme which is the Cutty Sark (it was the victim of a fire - and according to the website will reopen in 2012). (seen on the right in one of the paintings - with his paint brushes and palette). 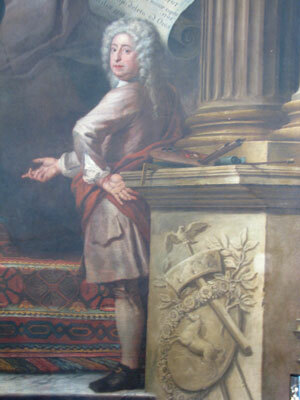 Thornhill started his commission in1708 and did not finish until 19 years later in 1728! 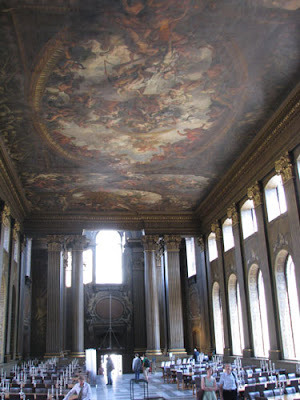 What's remarkable about the Hall is it he used a lot of trompe l'oeil to achieve the effect of sculpture. This Hall - just in front of this painting - was also where Lord Nelson's body lay in state for three days following his death at the Battle of Trafalgar. 30,000 people came to pay their respects before the coffin was moved up the river by barge for the funeral at St Paul's Cathedral. 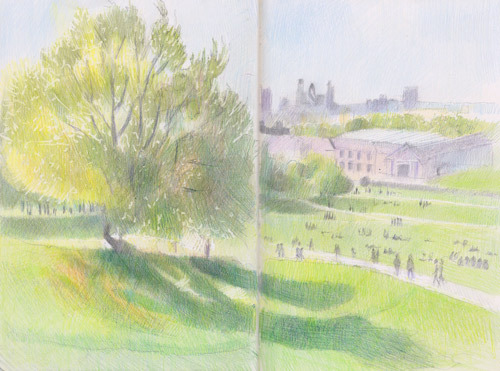 Having had our history lesson for the day, we then walked across the road and entered the park and walked up the hill until we found somewhere high enough up and reasonably flat where I could sketch. The main purpose of this expedition was to try out the new portable chairs I'd bought. 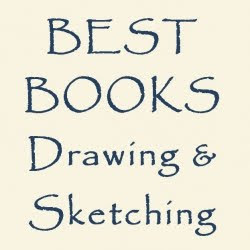 In the event I found out that they set up and fold up easily, go in a bad which is easy to carry and are exceptionally comfortable to sit for sketching purposes when the ground is not completely flat! 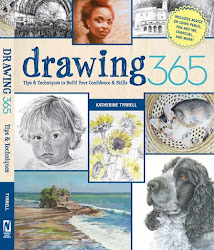 (Review to follow on Making A Mark Reviews). Which means they'll be going to Provence! I'd been watching the excellent documentary on LS Lowry the night before and decided I had to have a go at some matchstick men as here were an enormous number of people in the park sunbathing and enjoying picnics and games. I discovered matchstick men are not as easy as they look! I've included nowhere near as many people as were actually there! I also discovered on the way home that the way to climb hills with my dreadful foot - which is still causing problems - is to walk up backwards. I looked very silly but it was a lot less painful and a lot faster! Next time I must remember to sit nearer the top of the hill! 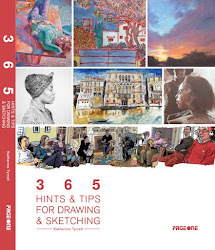 Then home via Waterstones, where I found three new art books to buy(! ), and the DLR. Last week my mother and I visited Dunham Massey and its Winter Garden which looks pretty amazing in Spring too! The great thing about this National Trust property is that, whereas a lot of gardens close in the Autumn and then reopen in Spring, this garden and the parkland are now open throughout the year. The new Winter Garden is the largest of its kind in the UK. The garden contains almost 700 different plant species and a further 1,600 shrubs specifically bred for the Winter Garden. All had to have at least two of the following characteristics of interest: winter bark, flower, fruit, autumn colour or scent and sound. My mother assures me that we used to go walking in the parkland I was a child and I vaguely remember doing so. However I'd never seen the house and moat close up and certainly had never visited the garden. 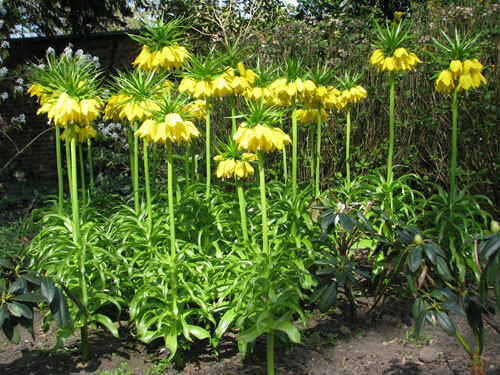 The Crown Imperials were absolutely splendid! 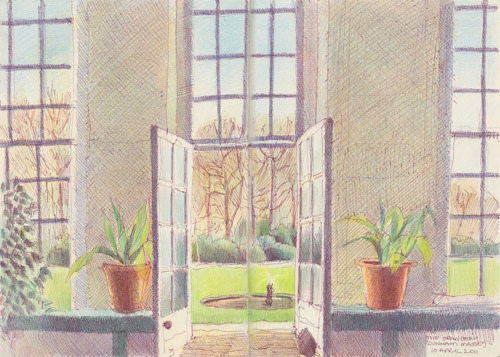 However given my recent problems with walking I was pleased to be able to take a break and have a lengthy sit down in the Orangery where I sketched the contre jour view of the doors and windows and garden beyond. I like trying to get the colour of white walls when they are against the light. I'm still not sure the value is dark enough but the colours of the reflected light are about right. This is the "postcard from my walk" in March which I posted to Martin Stankewitz in Germany (see A Postcard from my Walk - Trees by the Tate - Greetings from London) at the end of last month. It's a sketch done from a place where I very often sketch - but not usually this view. 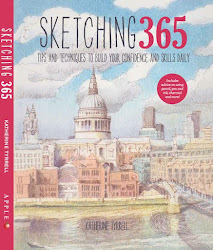 Normally I'm sat facing the Tate Modern Museum and am sketching all the people sitting on the grass - or I'm looking across the River Thames to St Paul's Cathedral. 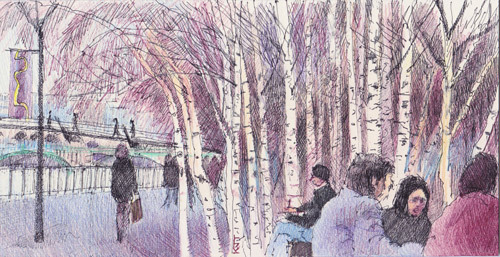 However it was a bit chilly so late in the day so coloured pencil was added afterwards! I even tried to make one of the people look a bit like Martin sketching although the profile didn't work out! I'm finding that mountboard is proving very useful for these postcards. It allows me to cut the board to the maximum size for a postcard. Plus I give both sides a double coat of fixative before I post the postcard. The dark arm on the left belongs to a Greek gentleman who was over for the exhibition. He was greatly intrigued by the way I sketch. 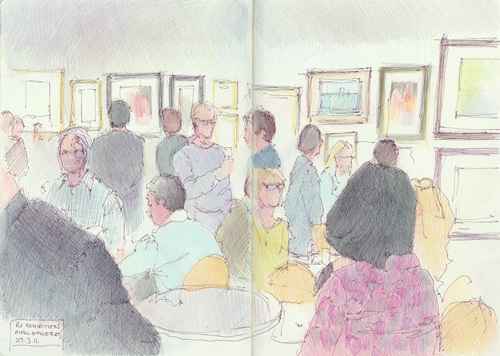 It was a little more unnerving to be later joined at the table by one of the people from the background of the sketch! 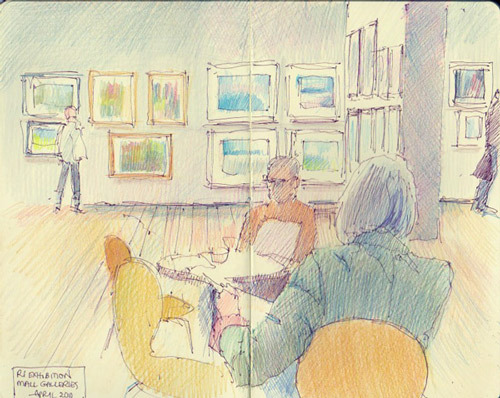 I seem to be making a habit of going to these exhibitions each year and then sketching while I have a tea break.